It takes months—sometimes even years—of planning to create the 11 minutes of magic that each corps delivers at the World Championships. This three part series—published in the winter issue of Drum Corps International Magazine—goes behind the scenes to see how four top corps put the pieces together in the off-season to produce the programs fans will see performed on the football field this summer. Read part I: The design meeting. Divide and Conquer In the weeks and months following the design meeting, the team members go their separate ways to work on their individual sections of the puzzle. "By the end of October, you have to pretty much have a sketch of the whole thing," Cadets Director George Hopkins says. "You get in agreement that these are the four pieces of music you are going to use, the storyline, the rough draft, and some ideas in terms of staging. [By this time] you might even have a color guard person involved and take their ideas. There is still a lot of room for development, but you know where you are going." Of course, every corps moves at its own pace. Some won't even have their design meeting until November, but those organizations generally do a lot of communicating before the meeting to make sure they know what direction they are headed. Once the story is sketched out, it's time to start working on musical arrangements. "By New Year's, all of the brass arrangements and probably a third to half of the percussion arrangements are written," says Dan Farrell, program director for the Phantom Regiment. I don't know anything about music. I'm not worried about what key it's in or what the harmonies are. I'm worried about whether it's effective. These are the first drafts. "Then you have to tear each number apart," Hopkins explains. "I'll take the first piece. Let's say it's three minutes long, and I'll listen to it a million times and just tear it apart and try to put it in a form that works for me. I put tapes together, I do sketches, notes. I'll send it to the arranger and say, 'Here's my view of this—now what do you think?'" Hopkins continues, "I don't know anything about music. I'm not worried about what key it's in or what the harmonies are. I'm worried about whether it's effective. Is there a flow to this that's appealing? Does it take into account all the visual ideas that we are trying to portray? Sometimes [brass arranger] Jay Bocook will call me back and say, 'You can't do that. You can't cut from here to there. It doesn't make any sense musically.' Sometimes, the drum guy will call and say, 'There's a lot of room for the keyboard section. We've got to do something more there.'" Technology has made this process substantially easier. 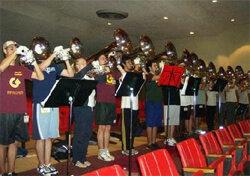 Traditionally, the percussion parts could not be done until the drum arranger was able to hear the brass parts performed on actual instruments. But today, music notation programs such as Sibelius can generate sampled sounds that give the arrangers a pretty accurate idea of how it sounds before the students actually play it live. The goal is to have at least one piece of music ready for a first rehearsal at the opening winter camp. The Cadets hold their first camp in December; the Blue Devils and the Cavaliers start in January. Phantom Regiment will initially use material planned for the show in their auditions, which are held around Thanksgiving. Typically, brass leads the way, with the percussion camp a month behind. Each corps will hold one or two camps each month throughout the winter. In between camps, the team is drafting fresh arrangements for the next camp, while revising the segment performed at the previous one, if necessary. "The goal is to be able to play a certain segment of the show at [each camp]," says Scott Koter, Cavaliers program coordinator. These camp rehearsals are recorded digitally and sent via e-mail to any design-team members who can't make the camp. "Then there can be discussion," Koter says. "'How's this sound? Does it give you any imagery?' So, there's lots of communication." Through all of this, the visual designers are waiting in the wings to create the drill that will determine how the corps members move on the field. Drill rehearsals—with color guard added to the mix—can start as early as February or as late as May, depending on the climate. Costume design continues in the background, as well, though dress rehearsals don't occur until the show is closer to its final form. Koter says it's essential for the musical arrangements to be strong before the drill is written, though input from the drill writer may lead to musical changes. "Sometimes the drill writer will say, 'Okay, this was supposed to be a 16-count transition here, or a 16-count build into a climax, but I have this great idea: I'd like 24 counts instead of 16.'" Tomorrow: "Putting the Pieces Together" Read part I: The design meeting.